Editor’s note: This article is one of an occasional series profiling the 15 finalists for the Milwaukee Awards for Neighborhood Development Innovation (MANDIs). The Innovations and Wellness Commons is a finalist for the State Farm Building Blocks Award, which recognizes a real estate project that advances the community. The store’s location in the heart of the Lindsay Heights neighborhood, where healthy food options are outnumbered by fast food joints and corner stores that peddle snacks, is an anomaly, said Sabir. The business is one of several located at the Commons that promote healthier lifestyles and food in Lindsay Heights, according to Fran Dawson, acting executive director of Walnut Way Conservation Corp. The Commons, a project of Walnut Way, is now in its second phase. 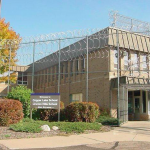 The first phase was completed in late 2015 and featured the rehabilitation of a historic building into a multi-use commercial space that also houses Outpost Foods, Fondy Food Center and a 5,000-foot commercial kitchen operated by the Milwaukee Center For Independence (MCFI), which provides housing and employment assistance to individuals and families with special needs. Operating out of the Commons was a natural fit for MCFI, according to Heidi Chada, vice president of employment and commercial services. The 53205 ZIP code area where the Commons is located has one of the highest rates in the city for unemployment and recidivism, and most childhood health statistics there are bleak, said Chada. 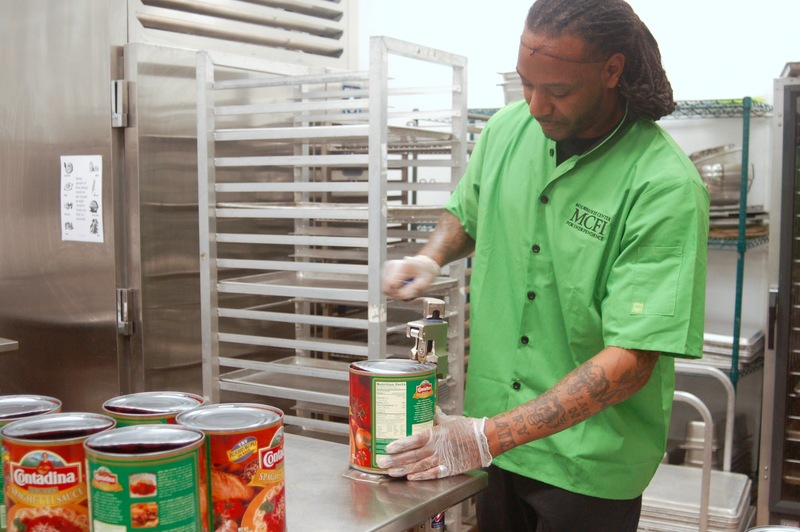 For her, that meant it was an area in need of the fresh and healthy meals MCFI serves, and also where the organization could develop and implement Level Up, its eight-week culinary training program. “With transportation being a major barrier, we knew that it was important that we be in close proximity to the individuals who will be trained and to kids who will benefit from the meals,” Chada said. Level Up participants are funneled into the program through partnerships with other organizations, including Project Return Milwaukee, a faith-based re-entry program for men and women. Kiel Simmons, 31, was referred through Project Return, and is in his fifth week of training at MCFI. “I love it because I’m helping to provide nutritional meals to kids that might not eat another meal the whole day,” Simmons said. He described cooking as a passion that he intends to turn into a career with the help of the training he’s receiving at MCFI. The lessons include hot and cold food preparation, using kitchen equipment, food safety, portion control and nutrition facts, as well as classroom lessons that teach soft skills such as how to speak with potential employers and communicate with co-workers, said Darryl Anderson, executive chef and director of food quality at MCFI. About 4,500 meals a day are cooked in the commercial kitchen at the Commons and distributed around the city, including to schools and day care centers, several of which are in Lindsay Heights, Anderson added. On the menu this day were barbecued chicken, green beans and cornbread. MCFI has created the equivalent of 11 full-time positions as a result of opening the commercial kitchen in the Commons, said Chada, who added that the organization also runs a summer meal program. Dawson, a longtime Lindsay Heights resident, said creating a healthy food hub and jobs was essential to realizing the goals of the Quality of Life Plan for Lindsay Heights, which was developed through resident input. Increased access to healthy foods was one of the plan’s main objectives. “The Commons has been a catalyst in the neighborhood and we will continue to encourage the creation and growth of health-conscious businesses in this area,” Dawson said. In general, there was a need for commercial vitality along North Avenue and in Lindsay Heights, where about half of commercial properties are vacant, said Juli Kaufmann, president of Fix Development. 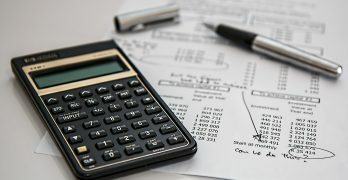 Fix Development has been working with Walnut Way and other organizations to develop the Commons, which cost $2.9 million for the first phase. Phase II will include construction of a new building adjacent to the current building, which will house physical, educational and economic development programming. “We believe the project will contribute to the overall wellness in the Lindsay Heights neighborhood and continue to shift the developmental focus in the community on empowering, wellness-focused investments,” Kaufmann said. But offering healthier food options and health programming in a community that has long lacked it is only half the battle, noted Walnut Way Board President LaVonda Graham, who’s lived in Lindsay Heights for more than 40 years. “When you introduce something to a community that has not had it in the past you have to prepare (people). You cannot just expect it to be there and them to patronize it,” said Graham. 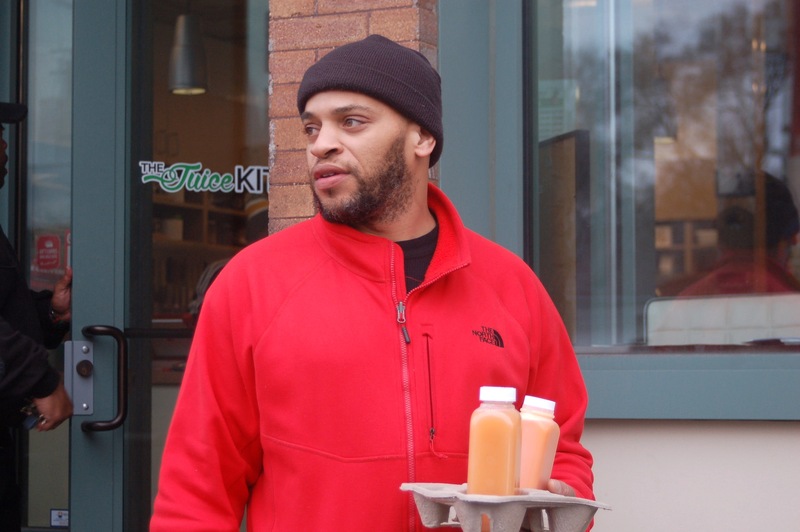 Though the Juice Kitchen appears to be thriving, the satellite location for Outpost, which offered natural and organic groceries, struggled. 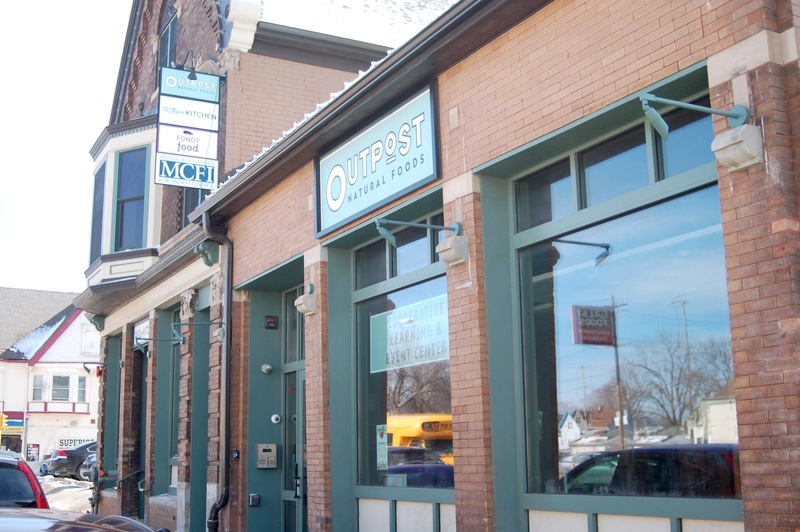 Outpost still utilizes the site as an Event and Learning Center, providing programming for residents and produce for other Commons tenants, but no longer runs a retail store there. On the top floor of the Commons sits the Fondy Food Center, an organization that works to connect Milwaukee residents to local, fresh food, and support local farmers, according to Jennifer Casey, executive director. One of Fondy’s initiatives is the Milwaukee Farmers Market Connection, which is funded by the Healthier Wisconsin Partnership Program. The project’s goal is to increase access to farmers’ markets in low-income communities. Part of that effort included teaching farmers at the Fondy Farmers Market how to leverage state and federal food benefits such as Supplemental Nutrition Assistance Program (SNAP) and FoodShare. As a result, the market has seen increased business in recent years, Casey said. According to Casey, farmers sold $67,000 via SNAP and FoodShare in 2016, which meant residents were buying more fruits and vegetables. “That’s public health in action, she said. It’s the type of improvement Patterson said he’s been waiting decades for. Increased access to healthy foods is one of the best things that can happen in a neighborhood, he said. Life giving! Good news is the best way to sustain hope and enthusiasm! Good afternoon Sherman park residents . A healthy numerous diet is a must , not only for adults , but especially children . A healthy , breakfast lunch and diner , will give you a good mind and body to succeed in life . Regardless of income , we must follow our dreams and reach for the STARS . Sherman Park will be bach WITHIN 5 years . Have a nice Saturday night fellow residents. Great deed. Healthy food is life.